Charles Edward Williams, a native of Georgetown, South Carolina, earned a BFA degree from the Savannah College of Art and Design and an MFA degree from the University of North Carolina at Greensboro. His work has been featured in numerous exhibitions around the country and is included in the collections of leading museums. Charles Edward Williams is inspired by the relationship between human emotions and our natural environment. He often chooses subject matter based on life experiences that have been humbling and sometimes traumatic. 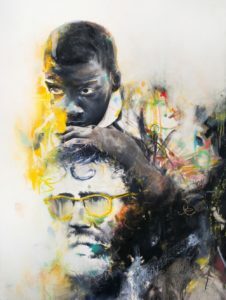 The psychological elements of his works are generated by personal and emotional responses to people, places and things. Each piece serves to orchestrate various viewpoints into a shared message of our human connectedness and commonality, which will entice viewers to explore from unfamiliar perspectives.